As we learned in the last chapter, we need wind to sail. What is wind again … ? Wind is moving air. This movement is a result of difference in pressure. Air moves from areas of high pressure to areas of lower pressure. Warm air rises up and leaves low air pressure, cold air is heavier and condenses. This happens in different places all the time and because of that the wind direction permanently changes. Before we start to sail we always have to ask ourselves which direction the wind comes from. As we learned there is true wind, wind of motion and apparent wind. We sail with the apparent wind. This is composed of the wind of motion and the true wind. The apparent wind always comes further from the front than the true wind. But how do we know where the apparent wind comes from? 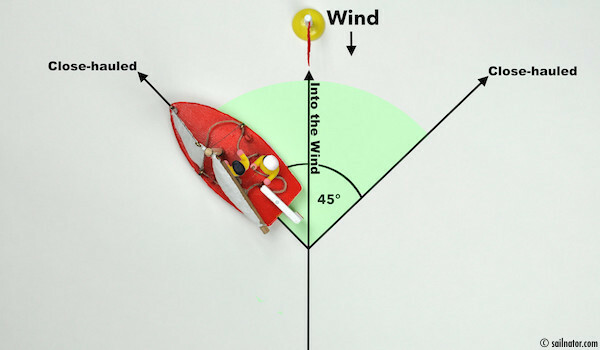 Most sailboats have a wind vane or a wind indicator on the top of their mast. 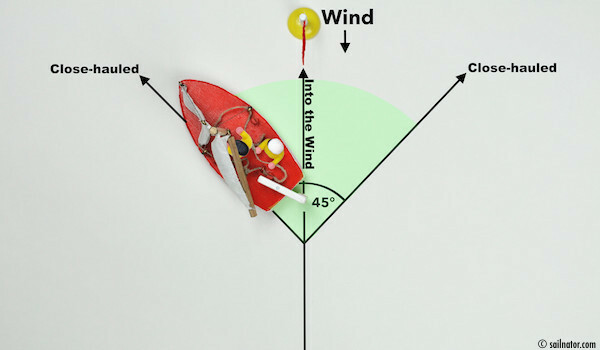 This shows you where the apparent wind comes from when the boat moves. In the marina, when the boat lies still and there is no wind of motion, it shows where the true wind comes from. To make the best possible use from the apparent wind, we have to trim the sails to the appropriate angle to it. So when we are underway with a sailboat we always have to ask ourselves where the apparent wind comes from and trim the sails accordingly. The direction we sail on the water is called course. 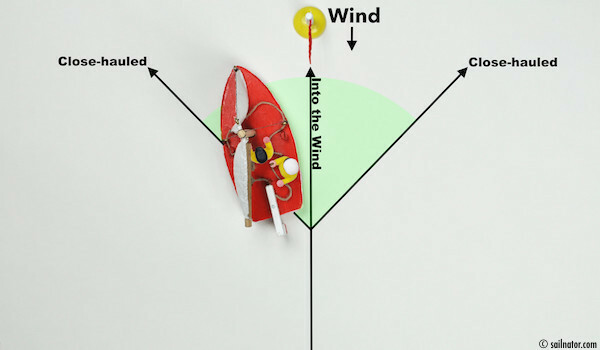 The different courses in relation to the wind are called points of sail. Each of them has a special name that we will now get to know. On the figures in this post the wind always comes from the top. 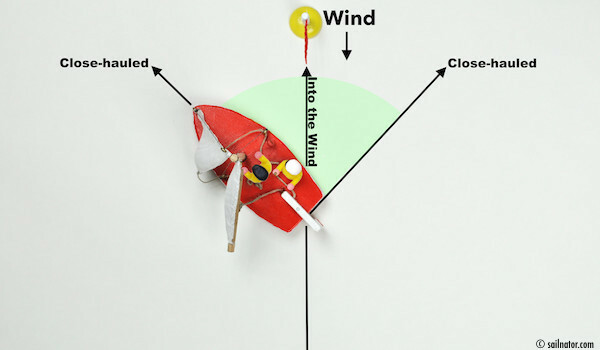 At first I place the bow of my model sailboat into the wind. As you can see the sails fall down in the direction the wind blows to. (Figure 19) This is exactly the way it is in reality. If the bow faces straight into the wind the sails point to the stern. The wind will blow the boat backwards which is called being “in irons”. 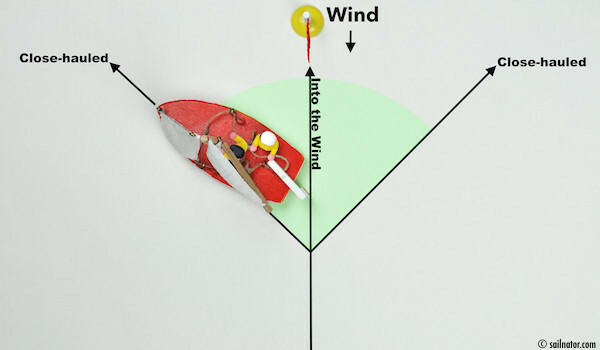 Figure 19: If the bow points into the wind the mainsail is in the middle of the boat and the jib luffs. To sail directly into the wind is impossible. In this position the sails are not filled with wind. They flutter which is called luffing. Therefore thrust forward by resistance or thrust forward by lift is impossible. The wind passes the sails without any effect. The boat cannot generate any power from its sails. To sail directly into the wind is not possible. The sector in which we are able to sail starts at about 45 degrees on each side of the wind. But this varies from boat to boat. 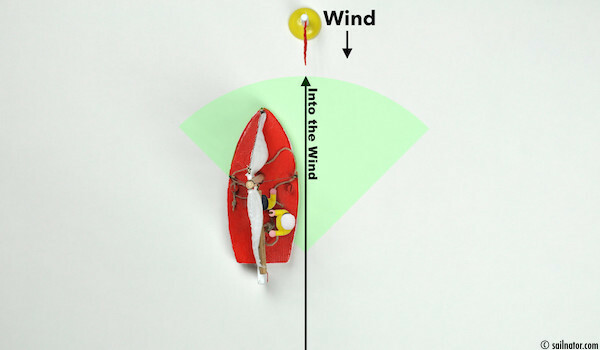 If we turn the bow a little bit away from the wind, which is called bearing away or heading down, the sails do not fill with wind immediately. (Figure 20) This only happens when the bow leaves the area marked in green. (Figure 21) To do this we have to haul the sheets, which are the ropes or lines that operate the sails. Figure 20: Even when the helmsman bears away, the sails do not fill with wind immediately. Figure 21: When the helmsman bears away about 45 degrees, the sails fill with wind. 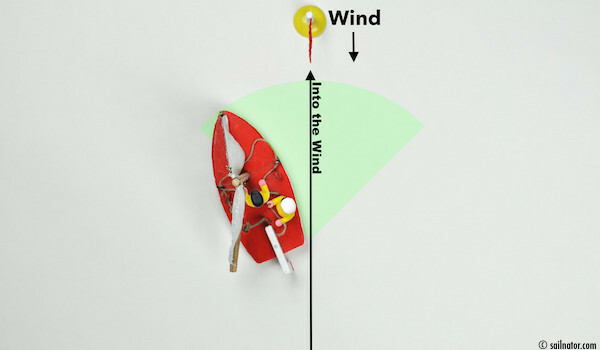 Figure 22: If the sheets are not hauled the sails are going to the direction the wind blows towards. The names of the sheets are mainsheet for the mainsail and jib sheet for the jib sail. The first course, where we can sail as close to the wind as possible is: “close-hauled”. As soon as we do not sail along the edge (between green and white area) anymore we talk about “close reach”. That is the area between close-hauled and the next point of sail. I will tell you more about that in the following chapter. But how do we trim the sails for close-hauled for an ideal angle to the wind? Do we have to ease or to haul them … ? When we open the sails the wind once again passes the sail without any effect. There will be no pressure gradient between the windward and the leeward side of the sail. To get thrust the lift is missing. Therefore we haul the sails. In fact we haul the jib sail as tight as possible (Don’t pull too hard though, everything has a breaking load) and the mainsail so that the end of the boom, the boom head, stands above the leeward corner of the stern. As we have learned already the helmsman always sits on the windward side of the boat and the sail falls towards the leeward side. As long as the boat does not heel the crew sits in the middle. In figure 23 my model-students found their positions and trimmed the sails properly like I told you earlier. But how do they know if they have reached close-hauled? Figure 23: The sails are trimmed properly. But how does the helmsman find close-hauled? The trick is to slowly head up with hauled sails. 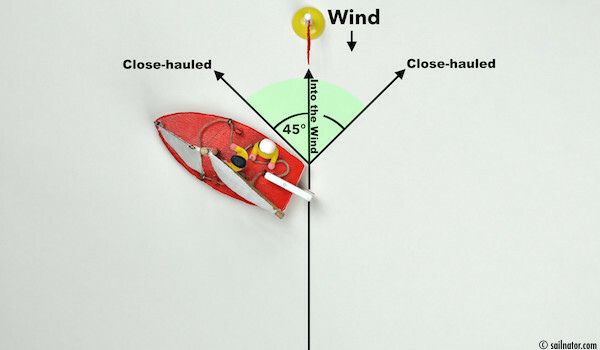 (Figure 24) What should the helmsman do with the tiller when he wants to sail closer to the wind? Does he have to push it or pull it … ? Right, he has to slightly push it away from her. Now let’s see what happens when we head up. Study the jib sail in Figures 23 to 26. Figure 24: The helmsman heads up until the jib luffs (flaps). The search for close-hauled goes the following way: We trim the sails (jib sheet pulled tight, boom head above the leeward corner of the stern) and head up slowly by pushing the tiller until the jib starts to luff. As soon it does this, we bear away by pulling the tiller till the jib fills with wind again and push the tiller back to the middle of the boat. Figure 25: Oops. He headed up too far. The jib already has wind from the other side. (backwind) The boat is “In irons”. Figure 26: The helmsman bears away till the jib fills with wind again. Then we look over the bow for a prominent point on shore, something like a house or a tree and head straight towards it. This little trick makes is easier to stay on course. On open sea we will need a compass for this. But as soon as the direction of the wind changes we need to trim the sails again or change the course and find another point at shore. Great. In the video Jenny just showed to us what the helmsman should say when he wants his crew to do something. This special language is called: commands. The commands are there to announce the manoeuvres on board and to coordinate them. That way everybody knows what happens next and acts accordingly. That avoids chaos and danger. Maybe in your country our in your sailing school different terms are used to the ones I use in this course. The important thing is that everyone on board uses the same terms and that the whole crew understands what you want to tell them. Now you learn at what point it is smart say something. In this chapter we have learned: It is impossible to sail directly into the wind. We always have to trim the sails in the proper angle to the wind. The first point of sail we got to know is called “Close-hauled” and we now understand how to find it.